Spitting is an aggressive behavior that undermines adult authority and does nothing to endear your child to his peers. Keep in mind that children are poor problem solvers. Causes include attempts to handle stress, an expression of anger, a bid for negative attention or a means of defense. Remain calm responding to the situation. Children sometimes spit to defend themselves. 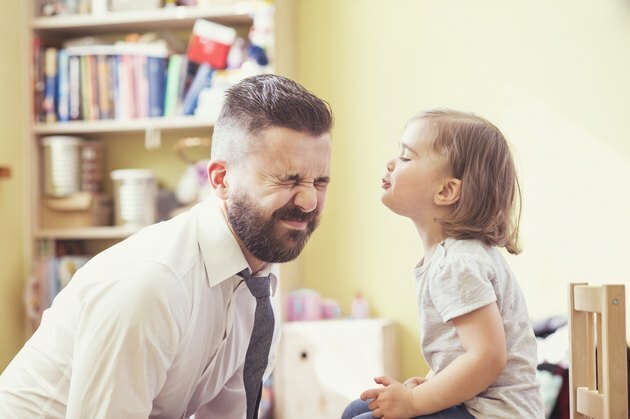 According to child behavior expert Dr. Eisa Medhus, your child may resort to spitting because he does not have the verbal skills necessary to defend himself in more productive ways. Teach your child how to leave situations that make him angry, rather than staying in a situation and pushing himself beyond his limits until he becomes frustrated and starts spitting at others. If your child is spitting to gain negative attention, it's best to ignore the behavior to stop the problem. Negative attention-seeking behaviors are only effective when a parent becomes upset, reinforcing the behavior by giving the child attention. If you ignore her, your child will learn very quickly that spitting is not an effective way to get attention. Consistency is important. Even one or two incidents of reinforcing this negative behavior will make it very hard to correct. If your child is angry and doesn't have good problem-solving skills, she spits as an expression of that anger. Handle this problem by allowing your child a safe environment in which to express her anger and validate her feelings while holding boundaries. Try saying, "I understand you are angry. I would be angry, too, if that happened to me. However, spitting is not an acceptable behavior, and we don't act that way in this house." Your child is likely copying other kids' behaviors, if the behavior has started after he was exposed to a new friend or situation. Ignoring the negative behavior and eliminating or limiting your child's exposure to this peer are problem-solving strategies. Talk to the other child's parent to work together to solve the problem. What Is Mental Abuse in a Marriage?